Statistically you are more likely to feel optimistic about life on a Friday afternoon than a Monday morning. Some people wrongly believe this has something to do with the timing of the weekend, but that’s merely a coincidence. It’s actually because Friday afternoon is when the weekly Econsultancy digital marketing stats round-up hits their inbox. This week we’ll be covering Dmexco, the Rugby World Cup and how the top 10 business blogs generate traffic through social media. 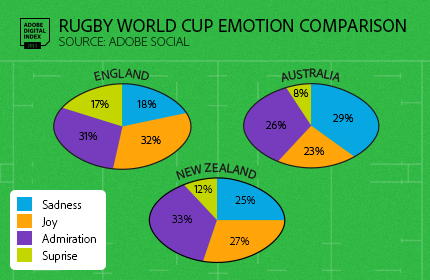 The rating was given by the Adobe Digital Index (ADI) and is based on a combination of social mentions, positive sentiment, social following and ranking within world rugby. England fans received an honourable mention for the most positive sentiment, with 63% joy and admiration. Australia came second overall with England beating Argentina to take third. The third annual PRCA report produced in partnership with YouGov has revealed some interesting statistics. The report reveals that in-house investment in influencer) outreach and engagement has seen 11% growth over the past two years, from 41% in 2013 to 50% in 2014 and 52% in 2015. SEO investment has actually dropped year-on-year, from 67% in 2013 to 53% in 2015. A new survey by RichRelevance and L2 has found that delivering a personalised experience is the number one priority when it comes to winning customer loyalty. The Amazon Prime effect of free, same-day delivery will be a big trend in the Christmas retail battle. The use of email to promote online and in-store sales, store-only sales and hybrid fulfilment all showed gains in 2015 while the amount of emails showcasing online-only sales dropped from 35% to 31%. Currently 50% of UK brands and 46% of EU brands have real-time in-store inventory visibility. But luxury is still lagging behind with just 8% providing this capability. A new report by Hubspot has highlighted some of the key social media trends behind the most successful business blogs on the planet. 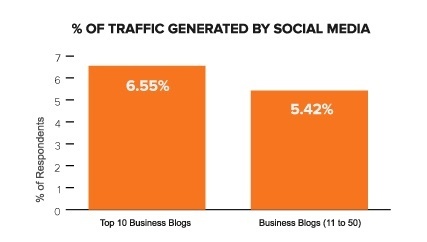 Of all the social networks, Twitter drives the most traffic to the top 10 blogs, although even this trend has decreased 17% year-on-year. Facebook and LinkedIn traffic has increased however, from 19% to 28% and 8% to 13% respectively. For lots more stats, read the full report. Sales were also down 6% on July, according to the IMRG Capgemini e-Retail Sales Index. This marks the worst performing August since the launch of the index in 2000. The index also revealed a trend in the split of mobile devices. Smartphones accounted for 20% of mobile sales in 2014 compared to 80% via tablets. In 2015 it is 28% smartphones and 72% tablets. A study of female millennials by Sofeminine has revealed some interesting traits when it comes to their attitude to advertising. Authenticity and brand trust is key. Trust is the top purchase driver, as 71% won’t buy without believing in the brand. Blogs are seen as the most truthful medium by over a third of millennials and are more influential than magazines or TV. Just one in six are influenced by what celebrities are endorsing, buying or wearing. A third of all female millennials cite what their friends are talking about as the biggest purchase driver. A new study by Sprout Social has found that nearly 90% of social messages to brands go unanswered, and the number of messages increased by 21% in the first quarter of 2015. The media/entertainment industry responds to roughly 1 in 12 messages. Brands in Asia receive more than three times as many messages than brands in Europe, Africa and North America. The Middle East has the best response rate at 13.1%. In a new report, Criterio analysed 1bn bookings from over 100 of the top travel suppliers and online travel agents (OTAs) and identified a number of key trends. Mobile share has doubled from 12% to 23% over the last year in the travel sector. Mobile apps are generating 49% of the mobile revenue of companies that are invested in in-app advertising and tracking, a 12% increase from a year ago. Smartphones are the most effective device upon which to close same day bookings: 47% on mobile, 58% on mobile and tablet. Connexity’s global abandonment survey of more than 60,000 ecommerce shoppers has highlighted some of the key behaviours when it comes to cart abandonment. 21% left because they couldn’t find the item they were looking for. 17% left because the item/colour/size was out of stock. 9% left because the item price was too high. Quintly studied 100,000 Facebook profiles and more than 8m posts from June 2014 to June 2015 and found that visual content achieves the most engagement on the social network. Links and images are posted the most frequently. Videos and images drive the highest engagement. Photo post interactions are increasing. The new report from iAdvize and eDigitalResearch also reveals that 56% of consumers would prefer touch points that are free of charge when contacting a company for support. Of the 77% who have abandoned their basket in the past, 29% say it was a direct result of a lack of available support. One potential option for online retailers is an online chat support community, with 62% of online shoppers saying they would be willing to answer other consumers’ questions in this way. Half of senior agency and publisher executives interviewed for a recent study around online ads believe the standards set by the IAB and Media Rating Council are not an adequate measure of viewability. The report by InSkin Media and FaR Partners also revealed that only 37% of respondents think the official guideline that 50% of an ad has to be in view for one second to be deemed viewable is sufficient. While half think this standard is insufficient in general, this rises to nearly two-thirds (63%) for larger, non-standard ad formats such as skins and wallpapers. The findings came from a study of 200,000 internet users by ZenithOptimedia. 16-24 year-olds across 34 of the world’s largest advertising markets will spend more time accessing the internet via mobile than via all other devices combined within three years, regardless of their location. Some countries such as Mexico and Saudi Arabia have already reached this tipping point.